Presenting new solutions to the industry is always a challenge. There are several steps to be taken from the bright idea into commercial solutions. First efforts in making barrier products were done already 30 years ago here in Raisio. Application area was packaging materials, paper bags etc. Back then the company was called Raisio Chemicals and it was also the same company that took the decison to build a dispersion plant in Kouvola, the plant that now serves as the production unit of CH-Polymers. 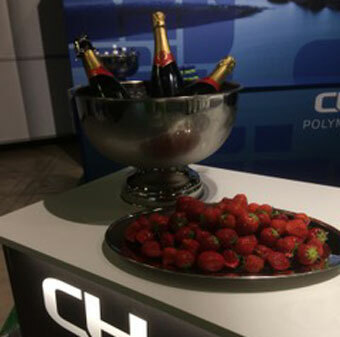 From those days CH-Polymers has come a long way and proudly presents CHP BAR series at the PacTec 2018 exhibition in Helsinki. Sustainability is more than just a word, today it carries commercial importance and is a driver in many projects. Whenever foodstuff is involved, the safety issues cannot be compromised. Avoiding migration of harmful components such as mineral oils used in printing inks into foodstuff improves possibilities for recycling. CHP BAR plays a major role there. Ask more! Visit us at the PacTec exhibition @7e100 and we can present our solutions, with some refreshments and a flavor of summer!